Saxatilis pike cichlids like Dicrossus maculatus are amiable South American cichlids that come in a wide range of different species and variants. The info below is true for Dicrossus maculatus as well as other species in the group and I will therefore from this point talk about Saxatilis pike cichlids in general. They are not that hard to keep, but you must be wiling to do some research and mimic their natural environment in the aquarium. Just as with the other pike cichlids, keeping the levels of nitrogenous waste at a bare minimum is of imperative importance. If provided with suitable conditions and a nutritious diet, Saxatilis Pike cichlids readily spawns in captivity. They should however only be kept by aquarists willing to carry out frequent water changes since they will die in the hands of the aquarist who carries out water changes “once in a while when I get around to it”. Try to mimic the natural habitat of Saxatilis cichlids when you set up the aquarium and include a lot of densely grown plants. Hiding spots are important; you can for instance use a few flower pots and a clump of Java moss. Adding some broad leafed plants is also recommended, since Saxatilis cichlids can use leaves as spawning sites. Saxatilis cichlids are shy creatures and will not spend a lot of time out in the open unless they feel really safe in the aquarium and know that suitable hiding spots are readily available. Efficient mechanical and biological filtration will help you keep the water quality up. Saxatilis pike cichlids need soft and acidic waters to thrive and breed, but if they have been kept in harder and less acidic conditions it is important to make the transition slow and gradual. If you want to breed Saxatilis cichlids, soft and acidic water is even more important. You can for instance use peat moss, rain water or RO water to adjust the water parameters. Wild caught Saxatilis cichlids often need some training before they understand that prepared food is actually food. Even Saxatilis cichlids who readily accepts prepared food should however never be kept on a diet consisting of prepared food only; they need live food as well. You can for instance use a high-quality flake food as a base and supplement it with live daphnia, brine shrimps and similar. The Saxatilis female is normally smaller than the male and since he can become a quite a bit aggressive towards her during courting, it is important to keep them in an aquarium with plenty of hiding spots among which she can retreat for some rest. Saxatilis cichlids often choose broad leafed plants as spawning sites and the female can produce up to 150 eggs per spawning. The first spawning will normally consist of a much lower amount of eggs. Don’t give up if the first few batches are eaten; this type of behavior is common in Saxatilis cichlids. When the eggs are eaten, the couple will normally spawn again within 2-3 weeks. If you leave the eggs with the parents they will eventually get the hang of it and the mother will start defending the eggs with much gusto against all intruders, including the father. Saxatilis eggs normally hatch within 72 hours (depending on water temperature) and the newly emerged fry will stay close to the spawning site, unless the mother decides to move them to a safe place. During the nights, she will hide them close to the bottom. You can feed the fry newly hatched brine shrimp and crushed flake food. Within short, the fry will be big enough to form a tiny school and follow their mother around in the aquarium. Saxatilis fry are very sensitive to poor water conditions and rapid changes in water chemistry. The best course of action is therefore to carry out a small water change once a day and carefully remove any traces of uneaten food after each feeding session. Before the fry gets too old they should be given their own aquarium. As they mature, the fry become more and more adventurous and when they venture too far from their mother, they can easily fall prey to other adult fish in the aquarium. The mother can also kill them if she spawns again, since she wants to protect her new batch. 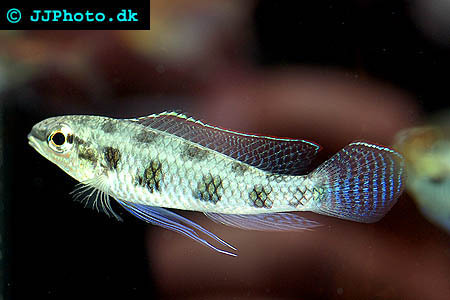 Letting Saxatilis fry stay longer than five weeks in the adult aquarium is therefore risky. If you want to reduce the amount of stress experienced by the young fry, you can of course move the adult fish instead. Dicrossus maculatus - spade-tail checkerboard cichlid.